Corsair K70 RGB MK.2 Mechanical Gaming Keyboard for $89.99, 50% off Samurai Jack Complete Series on Blu-ray, Preorder Anthem Get $10 Gift Card, Kingdom Hearts 3 Get $10 Gift Card. Released yesterday after five years since the previous game. This deal gets you 15% off the original price along with a download code for an additional game. 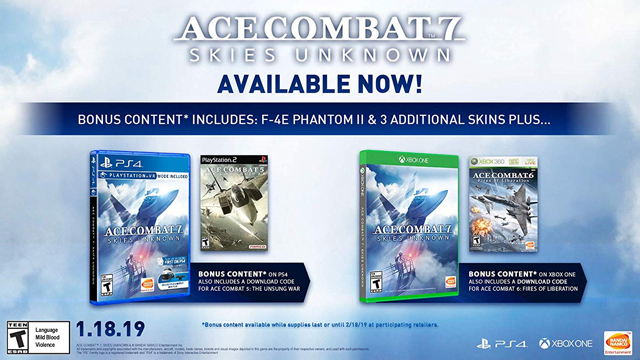 The Xbox One version comes with Ace Combat 6 while the PlayStation 4 version gets you Ace Combat 5. This is the lowest price this wireless charger has ever been but the deal will only last today. Make sure your phone is compatible before buying! Do you love the clatter of a keyboard? If so, this is the keyboard for you. Colorful backlighting is the highlight of this keyboard, featuring responsive keystrokes and puts a focus on gaming. Haven’t picked up the latest Call of Duty? Get it for half off at Best Buy. This deal is up for the physical copies of the PlayStation 4, Xbox One, and PC version of the game. Gloomhaven dominated BoardGameGeek’s top ranked board game chart for all of 2018 and even today it is still holding strong at #1 with a nearly 9/10 average user score. The 20-pound packed-to-the-brim box should be enough to tell you this game is serious. This is a single-player or cooperative story driven board game that can easily cost you 100 hours or more of your time. Even at its retail price of $140 no one who owns it would deny that it’s well worth the cost, but you can get it today for almost 20% off. If you love the Samurai Jack series as much as I do, you’d pick this up in a heartbeat. This set includes every Samurai Jack episode fully remastered, including the more recently released season 5. The last time this set dropped in price was way back in July of last year. Not only would you score a pretty amazing deal for a massive 86″ LG 4K Smart HDTV, you’d probably have bragging rights to the largest TV in your neighborhood. Imagine watching the Super Bowl on this baby. Use the bonus $250 gift card to pay for an Xbox One, PS4, or Switch, laptop, VR headset, or anything else that Dell sells on its site. The gift card arrives within 20 days after the ship date and is good for 90 days. Get the lowest price I’ve seen for one the most popular universal remotes on the market. Despite the low price tag, this remote can control up to 8 different devices, has one-touch activity buttons (macros), an informative LCD display, and a simple online setup with support for over 225,000 devices across 5000 brands. This coupon code drops the price by over 40%. I’ve actually used this a few times now to restart my car after not having driven it for a while. This 800A peak jump starter is powerful enough to jump start your 6.0L gas or 5.0L diesel vehicle and the 15,000mAh power bank can recharge your smartphone multiple times in one charge. In our professional opinion, Assassin’s Creed: Odyssey is the best game in the entire AC franchise, which is a tall order considering the quality of the AC games before it. It was just released four months ago, but that hasn’t stopped the price from dropping like crazy. Today it’s cheaper than it was even on Black Friday. Amiibo for the new fighters in Super Smash Bros. Ultimate are not always available. Preorder the few that are available now before it’s too late! Take note, these amiibo preorders are not all from the same store. This 65″ LG 4K Smart HDTV normally sells for $899.99, but it’s currently on sale for $599.99. Dell is the only vendor that’s including a bonus $100 gift card. Use it to help pay for an Xbox, PS4, Switch, laptop, VR headset, or anything else that Dell sells on its site. The gift card arrives within 20 days after the ship date and is good for 90 days. Education isn’t cheap – and it’s usually very expensive – so don’t pass on this chance to get some accredited instruction for a really low price. Udemy courses run from $100-$200, but there’s always a hidden sale that drops the price substantially, usually $10-$15. $12.99 is among the lowest prices we see. Udemy is one of the largest online course sites in the world, and there are tons of courses on relevant topics like computer programming, game design and development, tutorials on Photoshop, Maya, Premiere, and more.